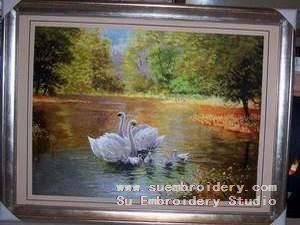 Ever since October 2004 when we started selling online, Su Embroidery Studio has sold silk embroideries to more than 30 countries. Below are just some companies that we worked with over the past years. 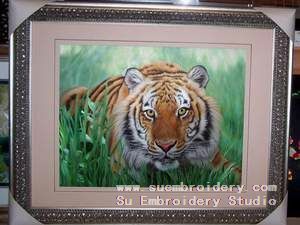 In February 2009, CEO of Wine Connoisseurs' Club William Rosenberger ordered two large size wild animal silk embroideries, 60 inches in height. View William Rosenberger's profile on Linkedin here. 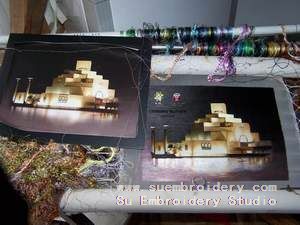 In February 2010 we made an embroidery hanging for the front of the altar at St Mark’s church in Niagara on the Lake, ON, Canada. View the church's website here. Qatar won 2022 World Cup bid. 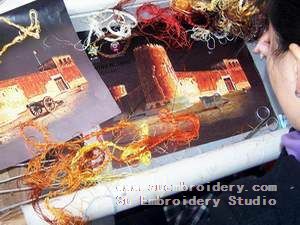 In March 2010, a government purchaser in Qatar ordered 40 masterpiece silk embroideries from Su Embroidery Studio through a trading company in Malaysia. 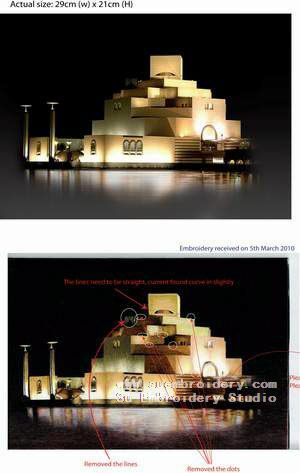 These 40 silk embroidery artworks were the gifts from Qatar government to the FIFA officials and were delivered to South Africa in early June 2010 where they attended the World Cup 2010. 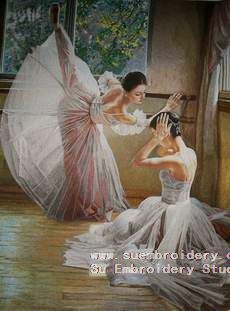 These are the highest quality silk embroideries and all were made by the most skilled embroidery ladies. We worked more than 3 months on the samples before they got approved finally. 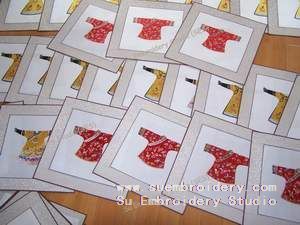 There were other embroidery companies that made the samples too but finally the client chose Su Embroidery Studio as the only producer for these 40 silk embroideries. 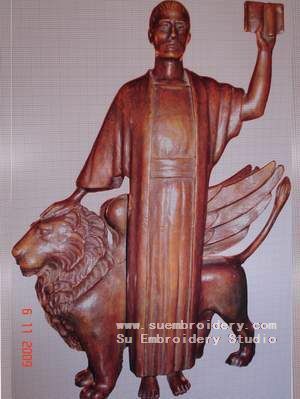 In July 2007, Jelco Pte Ltd, Singapore ordered 300 robe embroideries from Su Embroidery Studio which were used to decorate hotel in Malaysia. 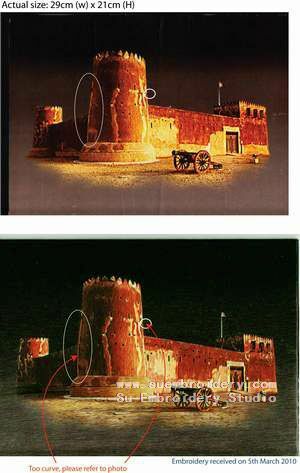 View Jelco's website here. In January 2010, Marie Georgiou, owner of Carbon Chemistry of Diamonds Australia, ordered three large size portrait embroideries, 60 inches in height. View Carbon's website here. At SES we understand that some people are nervous about ordering over the internet from a site you are unfamiliar with. 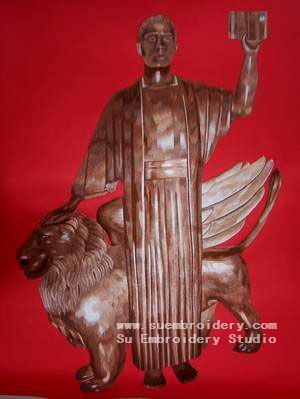 Since 2004 SES has had many return customers who have also recommended our embroideries to their friends and colleagues. Many of these customers have not only offered to provide testimonials but also to personally reassure new customers of the quality, value for money and integrity of our studio. There is a list provided of customers who would be more than happy to chat to you about SES anytime. Please feel free to contact us to ask for the contact details of the customer who is near your place or in your same state. We just want you to feel absolutely confident about our service and product quality. Arun Srivatsa, Fremont, California, USA He has purchased from us 26 times since 2006.